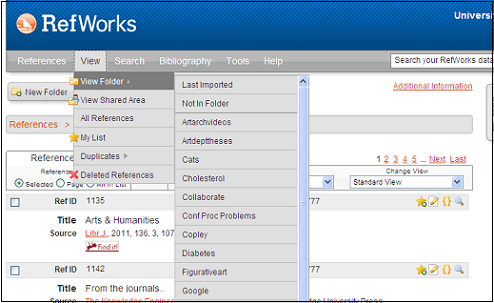 You can file your references into different folders as a way of organzing your RefWorks database. A folder can be for a specific class or assignment, for a research topic, or for a chapter of your thesis. A single reference can be in multiple folders, or none at all. You can remove an item from a folder without deleting it from your database. Items from your last import. When you choose to delete references, they are kept in this folder for 30 days. If you change your mind, you can restore references from this folder before the 30 day waiting period is over. The new folder appears in all of the folder lists throughout the program. Click the box next to Ref ID for individual titles in the list. These selections are not saved when you go to the next page. So be sure to add the references to a folder before moving to another page. 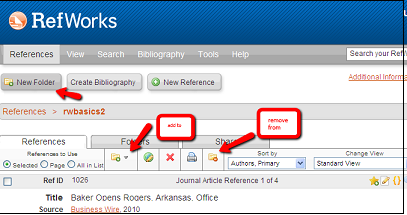 To remove records from a folder, use the selection methods described above and click Remove from Folder. Even though you have removed records from a folder they will remain in your database until you delete them.